Pies needs an official England World Cup song, and we want YOU to choose it for us. We’ve got a shortlist of XI songs for you to vote for. Vote, then leave a comment with the reason behind your choice. 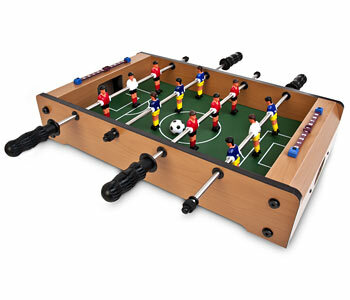 So the best comment will win this smashing table football game! Hell yes. It comes from those people at IWOOT and you can read more about it here. Also, courtesy of Griffin Technology we have six sets of earphones, and power chargers for iPhones. Terry Venables and The Sun’s version of “If I can dream”! I am v happy with the way the vote is going so far. That is all. the public has voted – and got it right so far! and dispite what anyone says I AM GOOD LOOKING! The 3 Lions original was great but I’m with spike on this one, Grab a stella is the best new anthem by far! COME ON ENGLAND UNITED! Everyone will be singing the original 3 lions anyway!!!! This party new England song which is being played at holiday parks across England because of the party England fan Dance routines! please check it out and it should be entered into this competition! can’t believe the scared cats song isn’t on the list – The England Family…that’s a chorus if ever there was one! Grab A Stella (Nelson Mandela) is by faaaaaaaaaaaaar the best… For a number of reasons..
2. Catchy as flip! I’ve got it stuck in my head still! 4. It’s obvious that first guy is reading the lyrics… Which makes it even funnier! The best song (THE WORLD CUP’S WAITING FOR YOU) isn’t there. I love the fact that Rik Mayall’s effort is basically a poorly-disguised audition for the RSC. I’m not sure he was aware the finished product would feature music as well. The best World Cup song, the one at home on the terraces is ‘Our Finest Hour’ by Winsome & the Churchills. Heres the link to Youtube http://www.youtube.com/watch?v=gvZt5oMShec Go take a look and listen.